Lauren Goldsmith pedals to the finish line. DERRY – Getting kids to read can sometimes be like getting them to eat their veggies; you have to resort to bribery every now and then. Gingras groupies cheer on their teacher.So, as a result of their impressive intake of books – every student at East Derry Memorial Elementary School met the recommended weekly allowance of reading – the entire student body was served up a decadent helping of teacher shenanigans on Friday. 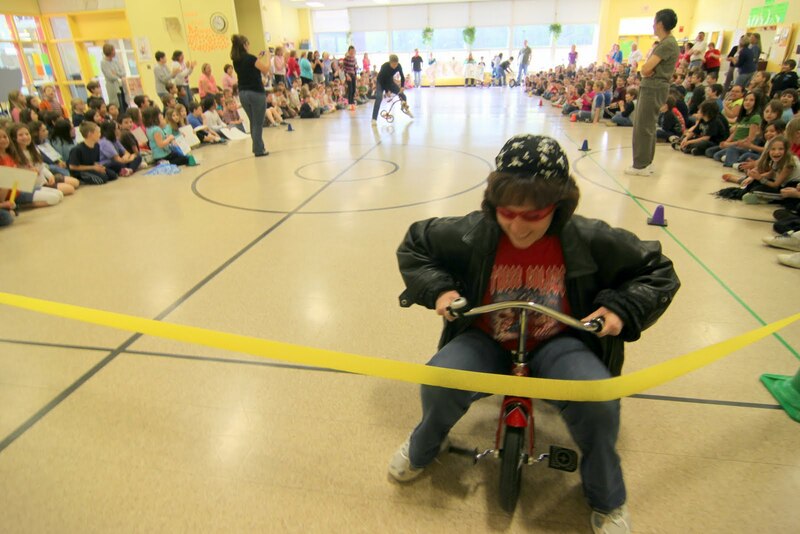 “We told them that each grade level had to read all week, and any grade with better than 85 percent participation, their teacher would compete in a tricycle race,” said Cathy Strople, the school's reading specialist. It was easily the big event of the marking period, a Teacher Trike Race Reading Grand Prix of sorts, with two qualifying heats and a final raceoff, pitting the two winners against school Principal Tom Poliseno. “No way. No waaaay,” said Poliseno, protesting an adult-sized tricycle wheeled to the starting line by one of his staff. He was wearing a hand-painted dayglo “Born to Tri” T-shirt, and a Sesame Street safety helmet that teetered on top of his head, held in place with an elastic chin strap. Students lined both sides of the gym, some of them waving signs in support of teachers, all of them lost in the high-test chanting that echoed throughout the gym, the volume accelerating as the teachers in the first heat mounted their trikes and waited for the whistle. Grade 2 teacher David Townsend; Grade 3 teacher Linda Wells; Grade 4 teacher Jen Gingras and Grade 5 teacher Paul Williams. Williams wins in the end. Several of the teachers valiantly tried to maneuver the miniature bikes by pedaling. Williams managed to qualify and take the big win using a technique that was described as “not exactly fair” by one teacher, who requested anonymity. However, Strople confirmed he was within the “one foot on your trike at all times” rule, and the win was good. The final battle, between Williams, Poliseno, and Goldsmith, ended with a bit of suspense, when Williams reached the finish first but waited for the others to catch up before gliding through the yellow tape and snatching victory from Poliseno. Poliseno was a good sport about the loss, although he suggested that if Williams ends up with an extra recess duty, for the record, it's pure coincidence. Ultimately, of course, the motivational fun was meant to underscore the efforts of the students, who are eager readers – the school's 2010 New England Common Assessment Program scores show 85 percent of students are reading at “proficient” or “proficient with distinction” levels, a 10 percent improvement over last year's scores. Poliseno credited Strople for her innovative and creative response to the students' good work. Strople credited Poliseno, for making it so easy to find new ways to embarrass him in front of the students – something that's always done in the spirit of school mascot EDD: the Owl – with respect, responsibility and safety. “Sure, it's fun to put Mr. Poliseno on the spot. But really, I'm just happy that the kids love to read,” Strople said.